Maurice Grant was one of two lawyers and a Cook County judge whom were honored by The Chicago Bar Association as this year’s Earl Burrus Dickerson Award recipients. The award, established in honor of the late Earl B. Dickerson, the first African-American to receive a law degree from the University of Chicago, is presented to lawyers and judges who have fought for justice and equality throughout their legal careers. 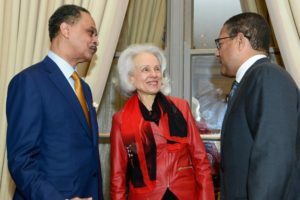 Maurice Grant, principal at Grant Law LLC, Langdon D. Neal, managing member and owner of Neal & Leroy LLC, and Circuit Judge Sophia H. Hall were recognized Tuesday at The Standard Club located in Chicago. During their remarks, each recipient recognized those who helped them along the way, including family, friends, business partners and past Dickerson award winners. The Dickerson awards date back nearly three decades. In 1990, the CBA gave the inaugural award posthumously to former Chicago Mayor Harold Washington, according to a list of past award recipients on the CBA’s website. Maurice Grant received his law degree in 1984 from the University of Maryland School of Law. He now specializes in commercial litigation, employment, corporate and real estate. Earlier in his career he served as a judicial law clerk for the late 1st District Appellate Court justice Calvin C. Campbell and worked as an associate at what is now Much Shelist P.C. The native Chicagoan thanked his family, including his mother, sister and his wife, for the impact they’ve had on his life. He also noted one past Dickerson recipient, former U.S. Supreme Court Justice Thurgood Marshall, who wanted to attend law school at the University of Maryland at a time it would not accept African-American students. Marshall later argued a case, Murray v. Pearson, which allowed Donald Murray to be the first African-American student at Maryland Law. “It is such an honor for me to have my name linked with his anywhere,” Grant said. Grant is also a musician. He has played piano since he was 4 years old. He later got a scholarship from DePaul University. Grant said he soon realized it was not the career path he wanted to take and switched his major to European and African history. This special award was established in honor of the late Earl B. Dickerson who was an outstanding lawyer and among the first African-American members of The Chicago Bar Association. His life and professional career were devoted to the law and helping others gain equality and justice. In this spirit, The Chicago Bar Association established the Dickerson Award to recognize and honor minority lawyers and judges whose careers at the bar emulate the courage and dedication of Dickerson in making the law the key to justice for all in our society. Read more about the current and past Earl B. Dickerson Award recipients.